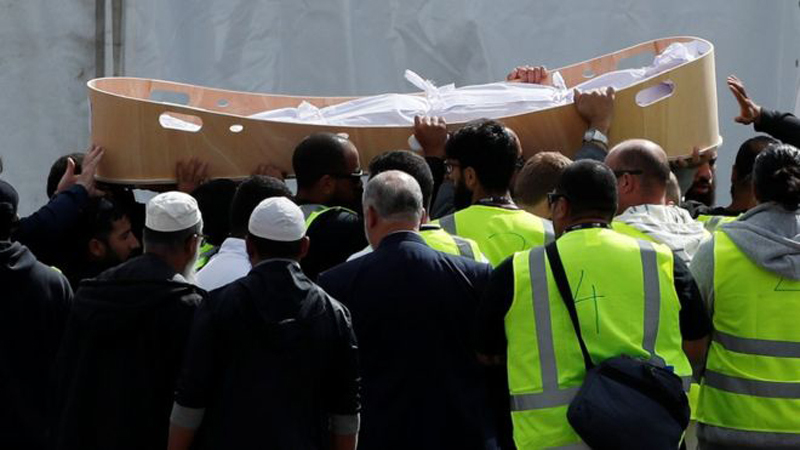 The body of late Syed Areeb Ahmed, one of the 50 people martyred in the gruesome Christchurch massacre, was repatriated to his hometown of Karachi on Monday. His body was flown to Karachi via flight EK-600 and was received by his father Syed Ejaz Ahmed, and later taken to Federal B Area, the neighbourhood he resided in. The only son of his parents, Karachi-born Ahmed, 27, was a chartered account by profession. His first funeral prayers were offered on March 21 in New Zealand and the second one was offered at Sangam Ground in Dastagir No 9 Monday afternoon. He was later laid to rest in the Sakhi Hassan graveyard. The bodies of foreigners killed by an Australian white supremacist gunman in the South Island city on March 15 are only now beginning to arrive back home after delays stemming from the police investigation into the massacre. The bodies of two Indian victims also arrived in their homeland on Monday. The Indian High Commission in Wellington said the bodies of two victims had reached their homeland and a third was scheduled for later in the day. The relatives of another two Indian victims had opted to have their loved ones buried in New Zealand, a consulate spokesperson said.